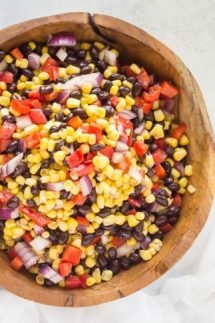 Black bean corn avocado salad is a really healthy summer salad that is hearty enough to eat for your lunch or serve as a side. We love to serve our black bean corn avocado salad with grilled meats such as my favorite marinated flat iron steak. Another great option to serve them with would be my simple Grilled lamb Chops, they really are fantastic! 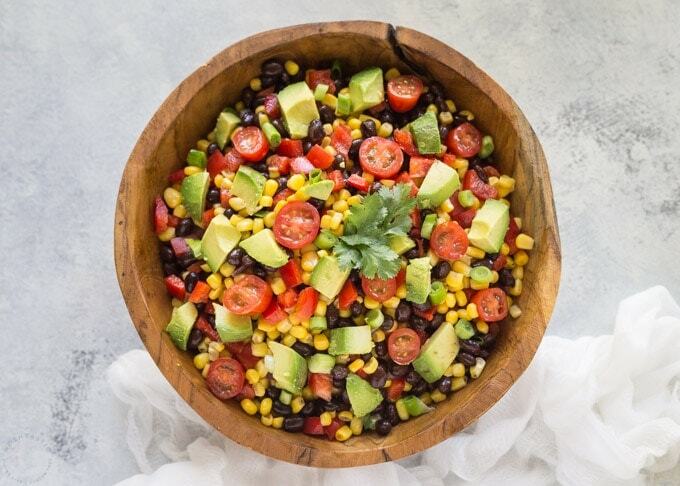 This Black bean corn avocado salad is a winner all round, it’s simple to make and packed full of nutritious vegetables. If you can get really super fresh corn on the cob that would be my top tip for making this salad taste awesome. Really fresh corn does not need to be cooked so you can shuck it straight off the cob and into the salad. If the corn is a little older I will usually cook it just a little bit in some boiling water for a few minutes. If corn is not in season simply use frozen corn, it works very well too. Another tip is to make the dressing first, that way you can pour it over the vegetables as soon as you have prepped them. 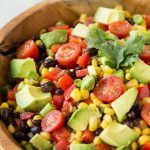 I’ve used honey to sweeten the dressing, but if you are vegan or making this Black bean corn avocado salad to serve to your vegan friends then you could substitute brown rice syrup instead. If you are making this ahead of time don’t add the avocado until you are ready to serve. You can however mix up add the other ingredients ahead of time without any issue. You’ll need a great sharp knife to cut your vegetables, and some really easy to wash cutting boards that you can throw in the dishwasher. I got my pretty wooden bowl from a local store but this one is similar. 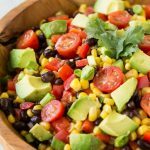 Quick and Easy black bean corn avocado salad, no cooking required! Shuck the corn and remove all the silks. Cook the corn cobs in boiling water for about five minutes, let them cool a little then cut the corn off. Or use raw corn straight from the cob. For frozen corn there's no need to defrost it, just add it as it it and it will defrost quickly and help chill the rest of the salad. Chop the tomatoes, green onions, red bell pepper, and avocado and add to a large bowl with the corn and black beans. Mix the olive oil, lime juice, honey, cumin, for the dressing. Pour over the salad and mix well to combine. Season with salt & hot sauce to taste. 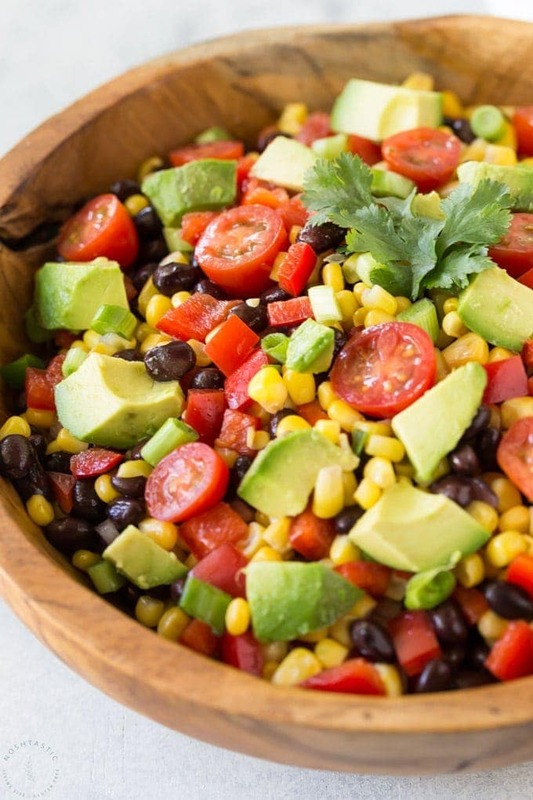 Black bean, corn and avocado salad looks yummy. Perfect cool and healthy dish for the warm summer days.